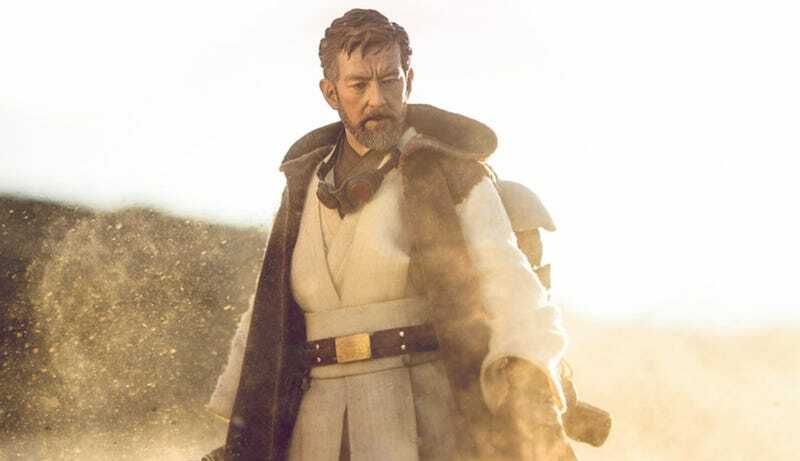 Disney and Lucasfilm have yet to formally announce if an Obi-Wan Kenobi movie is going to happen, but Sideshow Collectibles is more than happy to give us a sneak peek of what the character might look like if the film gets made. The company has just officially revealed a new 1:6 scale Obi-Wan Kenobi figure based on what the Jedi Knight may have looked like between Revenge of the Sith and A New Hope. It’s called Mythos Obi-Wan, and here are a few photos courtesy of StarWars.com. The figure, which was first teased back in July before making an appearance at San Diego Comic-Con, is based on a long sold out statue of the same name, which you can see below. This new figure, available to pre-order on September 21, has a ton of cool little details that place him specifically in the post-Sith, pre-Hope, Rebels/Rogue One timeline. He’s got some old Clone Wars armor, he’s holding onto Qui-Gon’s lightsaber, he’s got Anakin’s lightsaber, and much more. Basically, if and when this Ewan McGregor/Stephen Daldry Obi-Wan movie happens, this is what he’s very likely going to look like. The designers even sculpted the face with both McGregor and Alec Guinness in mind. For pre-order info, head to this link. For an interview with the figure’s project manager, head to the below link. What Did Obi-Wan do Between Cutting Anakin&apos;s Legs off and Meeting Han Solo?